Gion Shinmon-so is a Japanese style inn in the Gion district, famous for Geisha and Maiko. In the evenings, you may have the chance to spot Maiko walking on the street. 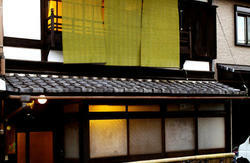 Gion district is the best place to feel the traditional taste of Kyoto. It is easy to access many major tourist attractions such as temples (Kiyomizu-dera etc), shrines (Yasaka-jinja etc) and shop streets within walking distance. Close to many stations and bus stops, it is an ideal location for tourism. All guest rooms are Japanese style renovated in March 2007. There are communal baths and also private (privately chartered) baths. No reservations required. 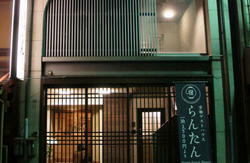 Kyoto\'s local cuisine, \'Kyo-kaiseki\' courses are served upon request. Inside each room, there is an air conditioner, refrigerator, TV, bath towels, hand towels, soap, hair dryer, toothbrush set, yukata (light Japanese robe), safety box. Bicycle hire is 1300yen per day. 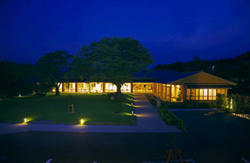 We have rooftop space (open during summer), a banquet room and a souvenir shop. Major credit cards including VISA, AMEX and MasterCard are accepted. 5min walk from Chion-in mae Bus Stop. It is 20min by City Bus #206 from Kyoto Sta. for Gion / Takano. Or, 5min walk from Sanjo-keihan mae Bus Stop. It is 20min by City Bus #5 from Kyoto Sta. for Iwakura. Or, From Kyoto Sta, take Subway Karasuma line, then transfer at Karasuma Oike Sta, and change to Tozai line and get off at Sanjokeihan Sta. 5min walk from there. Or, 15 min from Kyoto Sta. by taxi.